ynthia Mosser recently became sentimental and interested in history  so much so, that she hangs onto bits and pieces from her everyday life and incorporates them into the ground of her mixed-media work. 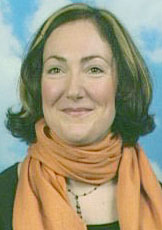 Cynthia, a native Portlander, is an adjunct faculty member in the Foundation Department of the Art Institute of Portland. "The Ecstasy of St. Cream Puff," mixed media. 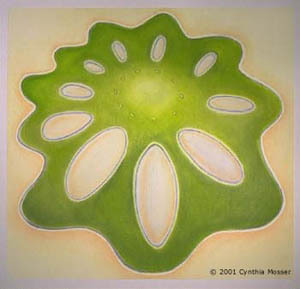 Cynthia Mosser's subject matter is a product of her obsession with shapes, doilies and intense colors. "I learned to play around with shapes a couple years ago and enjoyed the freedom," she said. "The possibilities seem endless." The shapes Cynthia uses are influenced by Portland's natural environment, the intense colors are a reaction to what's missing from it. "The round form makes me happy, so I'm sticking with what makes me happy." 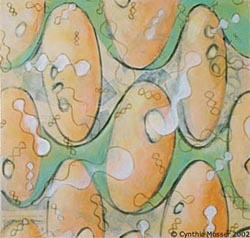 Cynthia uses a combination of collage, paint and wax. She starts with a traditionally gessoed panel, adds collage using old letters, love notes, photographs, exhibition cards and airline tags, paints over it, sometimes sands it down, paints over it again and then layers encaustic medium and oil paint over the top. "It is a definite process that requires patience," she said. 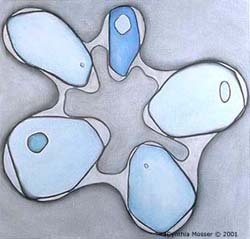 "Untitled Conversation (blue)," pastel drawing. 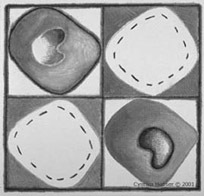 Drawing is Cynthia's first love because of its immediacy. "There's an element of freedom and spontaneity with drawing because it's quick and elemental," she said. "I'm not saying all drawings are quickly executed, it's just that charcoal or Conté crayon are so much more readily present than paint. I'm also someone who loves line, so drawing with charcoal or Conté crayon are natural media for me." Though it has taken her more time to understand color and application, Cynthia is now beginning to enjoy painting on a level equal to that of drawing. Nature influences Cynthia's art; Europe inspires it. "My inspiration is also my level of contentment," she said. "Doing art on a consistent basis makes me feel ecstatic. It's something I have to do to maintain balance; otherwise I walk as though I am leaning and literally off-kilter." Cynthia is represented by the Marghitta Feldman Gallery on Northwest Eleventh and Marshall in the Pearl District, and the Rental Sales Gallery at the Portland Art Museum. This month Cynthia's work is included in "The Exquisite Corpse Exhibit" at the Art Institute of Portland. Future exhibits include an October show at the Washington State University Gallery in Vancouver and an April 2005 show at the Marghitta Feldman Gallery. 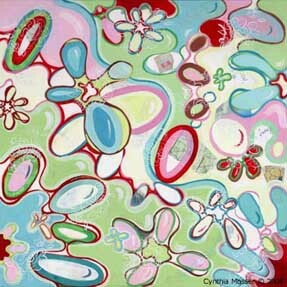 With an artist father and a photographer mother, Cynthia's exposure to and attempts at art began at a young age. "Art was always something in which I excelled," she said. "Particularly finger painting in pre-school  I had a talent for it early on." A high school beginning photography class grabbed Cynthia's interest; particularly abstract black-and-white photography and working in the silence of the darkroom. To Cynthia, photography seemed more about composition than anything else, and that seemed easy for her. "My senior year I worked as a yearbook photographer, but I never took photography seriously as though it might be a career  I did know, however, I was good at it," she said. "Later, at Whitman College in Walla Walla, Wash., I managed the student darkroom and worked as a photographer for the creative arts newspaper, Carbon 14." Upon her arrival at Whitman College, Cynthia's freshman college advisor, an art history professor, insisted she take a course from him. Cynthia had never even considered majoring in art, but continued taking art history classes simply because she found them interesting. "It wasn't until my junior year that my biology and pre-med major just didn't fulfill any kind of inner need, so I switched to art history," she said. "I took studio art classes to fulfill requirements for the degree. "Studio art was the most fun I had at college. I also remember the studio art professor, Keiko Hara, talking about art in a really extemporaneous manner. When she spoke, I didn't want her to stop. It was if I couldn't get enough." Cynthia knew art was what she wanted, and art history seemed practical in terms of a career choice, so she stuck with it. 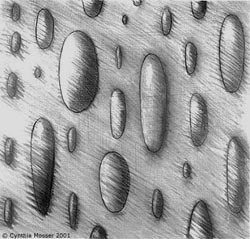 In addition to studying art, Cynthia earned a minor in biology. She spent two years looking through a microscope at plant and animal cells and a semester in marine biology peering at microscopic plankton forms and interestingly shaped and colored sea anemones. That element of biology has infused itself into her work. But deep down Cynthia knew fine art was what she really craved. "A few years after I graduated from Whitman, I decided to take fine art seriously, so I attended Pratt Institute in Brooklyn, N.Y.," she said. "Untitled Leaf Salmon," pastel drawing. Having finished her work at Pratt, Cynthia woke up one morning and decided she had to go to Europe again. On a whim, she chose Prague. "Some friends told me it was culturally rich, and I knew I could live there legally and survive by using my Teaching English as a Second Language certificate," she said. "So I bought a ticket and went." Cynthia's main goal was to allow herself to become an artist. "I'd lived in Europe before, in Paris and Geneva, and I knew how to maneuver around," she said. "When I arrived in Prague, I walked to the center, bought a newspaper and started calling English-language schools. Within one week I'd found a place to live, within two weeks I started teaching English." But six months later, Cynthia still hadn't done any art, because she was still in survival mode. So she started painting and painting and painting. "I put together a portfolio of fun fashion illustrations and called English- and Czech-language publications and asked if they needed any illustrators," she said. "All of them said yes, so I brought down my portfolio. "In a week I got my first freelance illustration job at the Prague Post." The jobs just kept coming. Cynthia also had her black-and-white photographs from Pratt that she wanted to exhibit. She asked the Globe Café if she could have a show; the owner said yes. 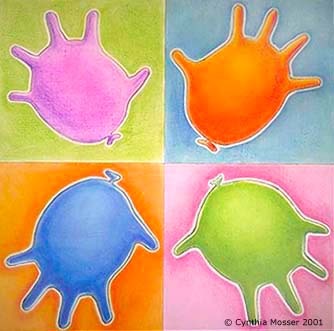 "Bubble Hands IV," pastel drawing. She created assemblage art at her studio, and toward the end of her year-and-a-half stay, had a well-publicized studio exhibition. "Europe has a culture and environment that takes art seriously," she said. "There's a level of respect for artists and an overall embracing of creativity and design within everyday life that for an artist is truly affirming and exhilarating. An example might be a restaurant owner's willingness to incorporate a hand-blown drinking glass in a dinner service or the gratuitous use of color in a café." Europe also gave Cynthia time and space away from other influences in the States. "Time in Europe seems luxurious and spacious and all encapsulating," she said. "You can read a book or cook a meal all day and feel as though there is nothing else you should be doing." When she was ready, Cynthia came back to the U.S.A.
"The opportunity here is so immense," she said. Cynthia's dream is to continually improve her technique and the quality of her work, sell more of it, expand into different locales and gain national recognition. "I would like to find a dealer in a new region and get a heavy-hitting artist residency and grant," she said. "I would also like to live and exhibit in Europe again. It is my spiritual home, particularly Brno in the Czech Republic. 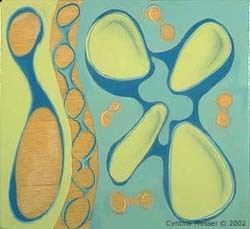 E-mail Cynthia at cynthia@cynthiamosser.com, and visit her Web site. You can reach Kathy at kanderson138@comcast.net, and draw on other Sketch Pads.